Seasonal Occurrence: Greatest numbers in April. May be found in spring and summer. 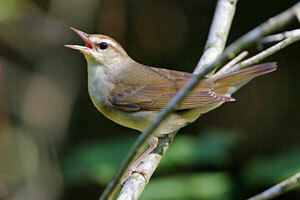 Notes: The Swainson's Warbler is a shy, elusive warbler which is usually found close to the ground in dense undergrowth of moist woodlands and swamps. It breeds in East Texas. Quite plain with no wingbars, its bill is unusually large. Adults in all plumages have similar coloring. Immatures resemble adults. Because of its secretive nature, population numbers have been difficult to attain. However, it is evident that this species has experienced serious decline, but has recently recovered. It was on Audubon's WatchList in 2007 but is no longer there, which is a good sign.